This image shows ice-front retreat in part of the southern Antarctic Peninsula from 1947 to 2009. USGS scientists are studying coastal and glacier change along the entire Antarctic coastline. The southern portion of the Antarctic Peninsula is one area studied as part of this project, and is summarized in the USGS report, “Coastal-Change and Glaciological Map of the Palmer Land Area, Antarctica: 1947—2009” (map I—2600—C). Ice shelves are retreating in the southern section of the Antarctic Peninsula due to climate change. This could result in glacier retreat and sea-level rise if warming continues, threatening coastal communities and low-lying islands worldwide. "This research is part of a larger ongoing USGS project that is for the first time studying the entire Antarctic coastline in detail, and this is important because the Antarctic ice sheet contains 91 percent of Earth's glacier ice," said USGS scientist Jane Ferrigno. "The loss of ice shelves is evidence of the effects of global warming. We need to be alert and continually understand and observe how our climate system is changing." The Peninsula is one of Antarctica's most rapidly changing areas because it is farthest away from the South Pole, and its ice shelf loss may be a forecast of changes in other parts of Antarctica and the world if warming continues. Retreat along the southern part of the Peninsula is of particular interest because that area has the Peninsula's coolest temperatures, demonstrating that global warming is affecting the entire length of the Peninsula. The Antarctic Peninsula's southern section as described in this study contains five major ice shelves: Wilkins, George VI, Bach, Stange and the southern portion of Larsen Ice Shelf. 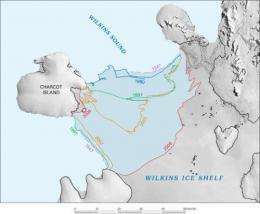 The ice lost since 1998 from the Wilkins Ice Shelf alone totals more than 4,000 square kilometers, an area larger than the state of Rhode Island. The USGS is working collaboratively on this project with the British Antarctic Survey, with the assistance of the Scott Polar Research Institute and Germany's Bundesamt fűr Kartographie und Geodäsie. The research is also part of the USGS Glacier Studies Project, which is monitoring and describing glacier extent and change over the whole planet using satellite imagery. Given that there are active volcanoes all around the rim of the WAIS and on the major peninsula, it would not surprise me if it were found that these are at least partially responsible for the rapid changes being seen in the WAIS while the EAIS is still going strong and getting colder and icier. After all, warmer waters do circulate around the continent. They eventually cool on making the trip, which helps to keep Antarctica cool overall and is what made Antarctica an 'icebox' anyway. But, if waters are being warmed by volcanic action on their way around it would be easy to see temperatures rise in the waters with climate change in addition. Has anyone actually gone and measured the temps in the areas directly around the Antartic volcanoes? It's not evidence of global warming- it's just that Thor used his hammer to break of a chunk of ice to use as a puck in the Valhala-Midgard hockey game. Those volcanoes have been active for a very, very long time, so why would they make a difference now? If their activity had significantly rampes up in the past few years, there would be seismographic evidence of the fact. Perhaps they were not enough on their own until things warmed up a bit in and around Western Antarctica. Two forces (volcanoes plus warming of local oceans) plus a third (wave action from ocean movements caused by Atlantic storms) now known can do a lot. Perhaps one or two or other were not enough for the ice sheets hanging off Western Antarctica into the ocean. I do not have all the answers, I only made suggestions. Oh, and by the way, there was some minor seismic activity in Antartica this morning--at least on the Eastern continent. I have yet to gain access to the Western Antarctic data. Never mind, just had a look at Ross Island and several other stations around the Antarctic continent. There looks like seismic activity all over, too. Of course, I am not a seismologist so I would not know for a certainty the cause of the activity. "We did find significant earthquakes in West Antarctica," he told attendees today (May 30) at the spring meeting of the American Geophysical Union in Washington, D.C. The press release was dated to 2002, of course. However, I do not see that now would be much different than then. It is of interest that significant earthquakes were found on the west coast. Of course, given that there is a rift there I would not be surprised. Recording and gathering data from seismic equipment in West Antarctica is not easy. The article then proceeds to mention the difficulties in obtaining the data and that a number of stations do not run year around. I was mainly wondering if there was a recent upward trend in activity-say, in the last 1-2 decades(although a shorter burst could be cause, as well)- which would, you would think, cause an increase in sea temperature there, depending on strength of thermo/halocline locally. As a side note, I think that there are a couple of active volcanoes on the continent itself. The Thor's Hammer crack was intended as a sarcastic swipe at the presumed antiAGW posts I expected to see- I was typing it, apparently, at the same time you were typing your post, so it ended up posting second. Wasn't a swipe-at least not directly- at you. I was just looking at my atlas- the area in question is about halfway along the extent of the peninsula, and quite a distance away from the passage between Ant. and Tiera del Fuego, so you would think that that(the Passage) would be the area more likely to experience more effect from warming. Interested to see what factor(s) are the culprit. I find it interesting that language like "sea-level rise if warming continues," is still used when the scientific consensus is that there hasn't been warming since the mid 1990s. Also it seems that overall ice is increasing, so myopic localized reports that insinuate the opposite of what broader data shows is not helpful. Please keep linking to the Daily Fail and Anthony Watts' House of Pancakes, they really add to the credibility of your (non)argument. So... the facts aren't in dispute, you just don't like the forums? Phil Jones statements are on the record. He is one of the AGW most cited scientists, though I suspect he might have fallen out of favor with that crowd as he might not be "their man" anymore. I dug around so that lazy people might be enlightened. Here is his statements to the BBC. The Daily Fail totally took the interview out of context, in many cases. Anthony Watts wouldn't know science if it ran up and helped him count to pancake. Did you really read the interview or are you just taking what other people have told you about the interview? And no, Phil Jones hasn't fallen out of favor. The fact that there has been negligible warming (+0.12 deg C) and negligible cooling (-0.12 deg C) over the last year indicates a plateau, not cooling, which was actually found in models that accurately predicted the effects of solar forcing. Again, though, you made no real argument, I just like to make fun of Anthony Watts and your linking to him. Whoops, my mistake. I typed "last year" when I meant "the last 15 years, according to CRU". It might interest many that CRU's estimates of global warming and their models are actually the most conservative of the major groups, not that that will stop any of the deniers from continuing to suckle at the dry teat of "climategate". Now, here is something interesting. It may just be coincidence, though. However, I thought it interesting to bring up. The Wilkins ice shelf near Charcot Island, Antarctica, had a major break event in March of 1998. On March 25, 1998, a large earthquake hit the Antarctic plate near where the Australian, Pacific and Antarctic plate meet. There was action along an E-W stress fracture. The middle frame is dated March 21, 1998. It looks refrozen. After March 1998, it is broken. We now know that there are waves that hit the Antarctic ice shelves regularly, and that these may be one of the primary drivers of ice shelf collapse. Coincidence? Or, is there more? Yeah, but you'd expect that wave action is pretty much constant over time, in lockstep with prevailing/seasonal wind patterns and currents, although if there is increase in sea level, it would be expected that wave-caused erosion/undercutting would increase. not that that will stop any of the deniers from continuing to suckle at the dry teat of "climategate". I have an open mind about AGW, but I am skeptical of (computer) models, personal experience tells me they are near useless for exploring new science. Otherwise we wouldn't need to build actual prototypes or particle accelerators that tells us where our computer models are wrong in the real world. However your juvenile attitude will brand me a "denier" and you won't provide any links or recognize the need for separation of politics and science. With you I sense it is all about standing on "settled science" to satisfy a need for moral high ground. I believe that is incorrect. Normally, increased erosion/undercutting result when sea levels descend. When sea levels ascend there is more deposition of sands and silts on the shore when the tides come in. In the case of the ice sheets in the ice shelves, these sit on the water and waves hitting the undersides of the ice will cause it to flex repeatedly and finally break off. That is what the Scripps study seems to indicate. According to the same study, the waves have their source further north in the Atlantic. These then deflect off of South America and gain energy and momentum and finally slam into the ice shelves and cause the sea levels to fluctuate up and down with the oscillation of the waves. That assumes that shore is exposed- which would then mean deposition of sediment upslope. Increasing sea level(for the sake of argument) would magnify flexion force due to ice bouyancy. Wave action, in either case, is certainly a factor. On the other hand, I expect that the waves you refer to strike the peninsula on the north side. This ice shelf is on the south(leeward) side of the peninsula. That paragraph tells me all I need to know about your capabilities, "Sanescience". It is evident, at least to me, that you don't understand scientific modeling, and that you've taken your understanding from places such as Watts' Wide World of Wiffleball. And your claim to just "separate politics and science" is a ploy to put yourself on a higher moral standing and give more weight to your argument, while you're the one that originally linked to sites that have little scientific merit. Don't you mean the west side? The Wilkins ice shelf is on the west side, connected with Charcot Island. The south side is attached to the continent. The north side points upward and then there is the east side of the peninsula as well, where Larsen B is located, if I recall correctly. Look at the contour of South America relative to the peninsula. Waves glancing off of South America would most assuredly slam the western side of the peninsula. But, now that you mention it, Larsen B is on the east side and I noticed I committed a real screw-up by posting the wrong video footage. Nonetheless, it is still an interesting coincidence (or not?) that Larsen B also broke around time after the 8.1 magnitude quake that struck the Antarctic plate along an E-W faultline. In the video, Larsen B was ok until afterward. I also just the other day read that temperature samplings have been taken of waters under one ice shelf further east on Antarctica. They are looking for signs of warming. So far they have found none. At present the waters are still near enough to freezing so as not to cause any melting down of the ice shelf there. But, even in spite of my error in posting wrong video footage for Larsen B, Wilkins ice shelf did experience a breakup event in March 1998, at the same timeframe as Larsen B and just after the 8.1 quake to the west. At that time Wilkins lost about 6% of its surface. It is a curious thing.